On MacDill Air Force Base. Must have military I.D. or be sponsored in by someone on base.Plays around Lewis Lake with dual tees (red & blue) and dual baskets (red & gold). Red->Red = 2810' - short & forgiving. Red->Gold = 3560' - extended length & challenge. Blue->Red = 3965' - longer but a bit safer. Blue->Gold = 4820' - long and challenging with plenty of water hazards and 4 par 4s. I-275; exit 41. South on Dale Mabry 5.5 miles to MacDill AFB gates. Follow N Boundary Blvd to right curve. Left at light then right on Bayshore Blvd for 2.5 miles to a right on Golf Course Ave. Go 2 miles to a left split onto Marina Bay Dr. followed by a left into the Lewis Lake parking area. 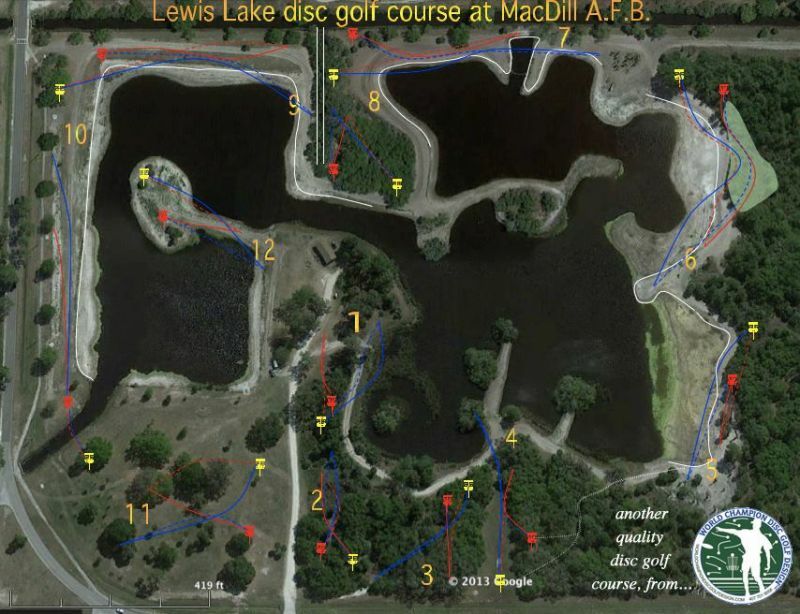 Have you played at Lewis Lake Disc Golf at MacDill AFB? Be the first person to review this course!